What Does the Future Hold for the Price of Bitcoin? Tuur Demeester is an economist and investor focused on personal and financial freedom and bitcoin, and editor in chief at Adamant Research. With all the commotion in the market, now is an interesting moment to take a step back and look at some price patterns. I think especially the price behavior of China versus US/EU can be instructive to assess what to expect from the markets going forward. 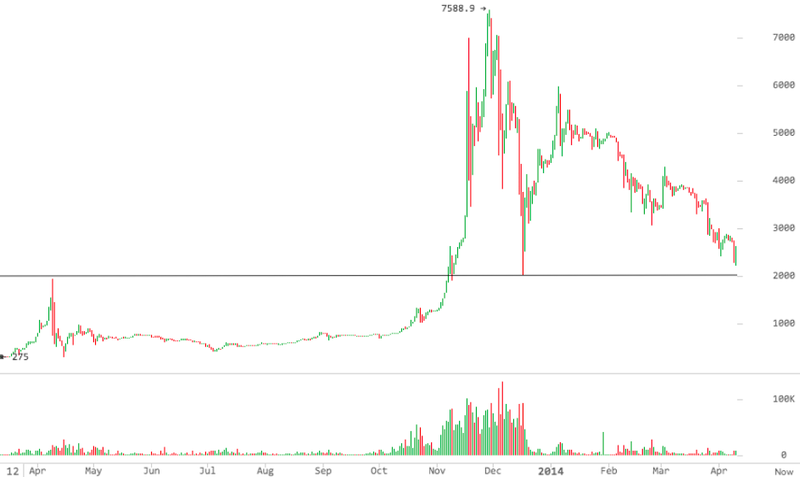 Indeed the price recovered, to as high as $705 on 2nd March, yet after that it declined again to a low of $382. The question now is whether this period of mid-April is giving shape to a final bottom, or whether it is just another down leg in a trend towards a retest of the $260 April 2013 high, or an even further decline. 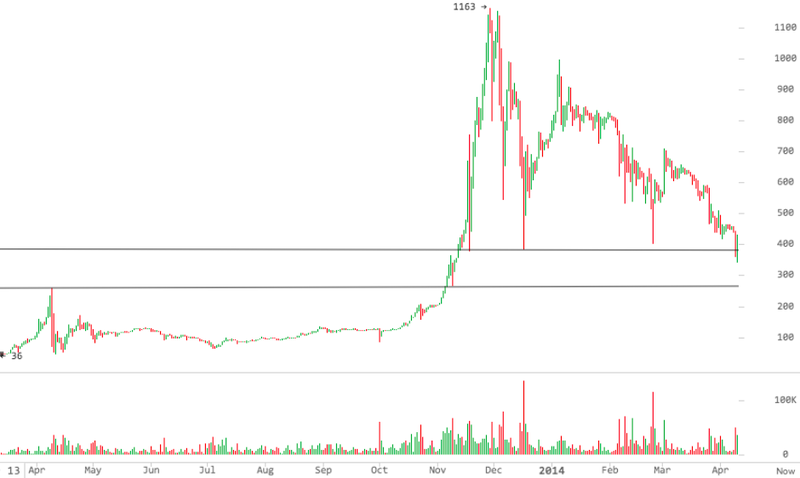 Will bitcoin stay above the technical support of $382? 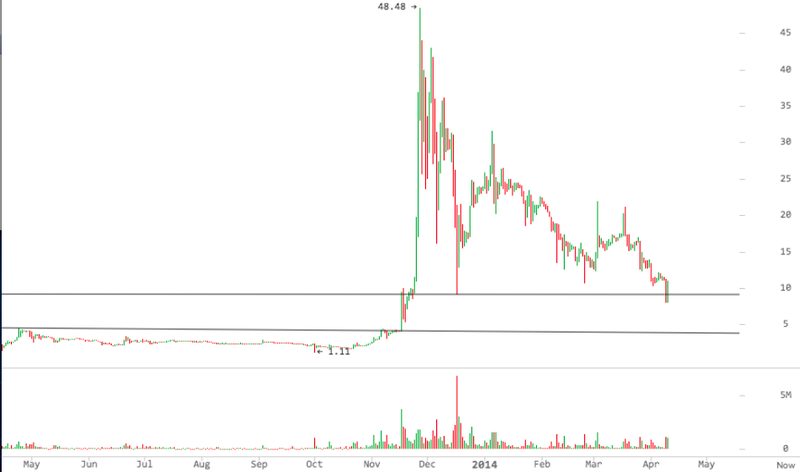 Litecoin bulls and bears are also in a fight over the $10 support/resistance level. So China seems to suggest that we are heading lower. 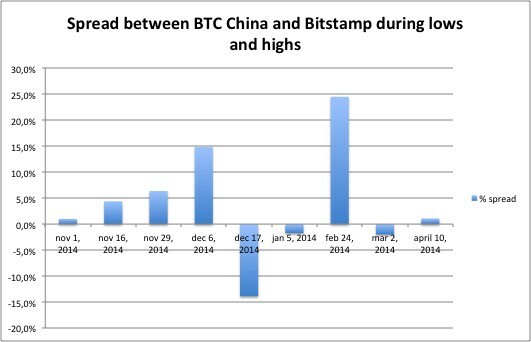 But how influential are the Chinese markets for the global bitcoin price? 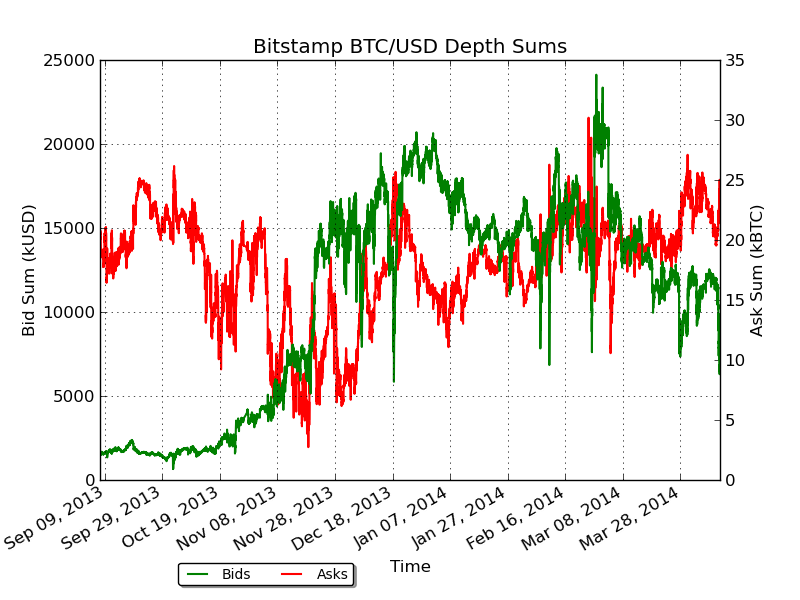 Please Note: For what follows, I’ll be using BTC China as proxy for China*, and Bitstamp as proxy for US/Europe. To make the spreads more apparent, I’ve converted CNY to USD using the historical converter on oanda.com. For China, the first leg of the rally arguably started on 1st November, from $203. The rally then became supercharged on 16th November, from $453, and peaked on 29th November at $1,237. 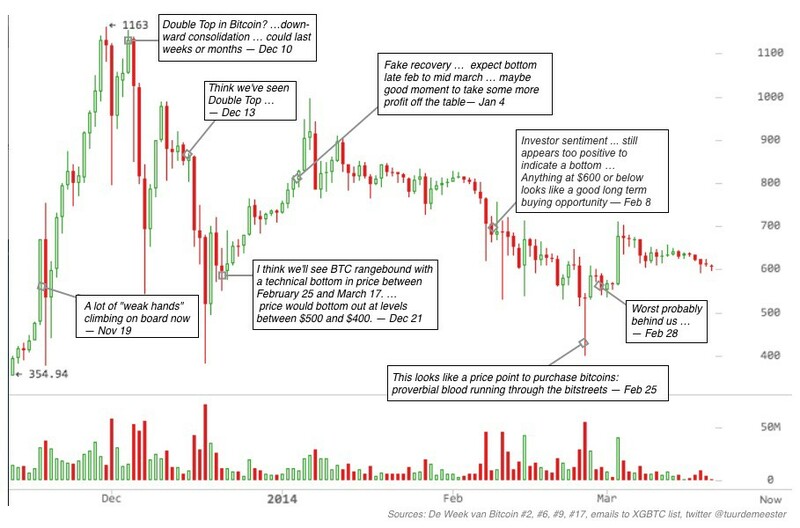 From then we saw a quick crash down to $623.50 on 6th December, and another down to $329 on 17th December. On 5th January, we completed a false recovery to $977.70, only to fall back to a low of $498 on 24th February. The most recent low of 2nd April was the equivalent of $392. 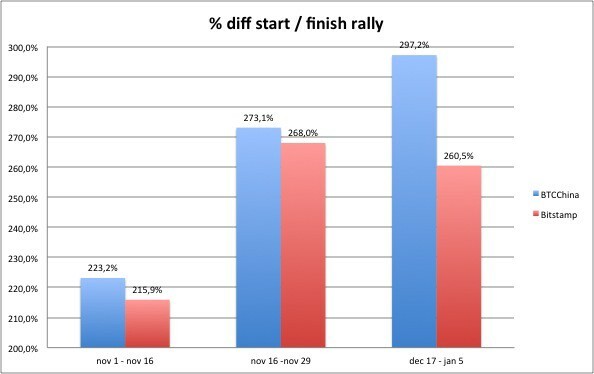 For US/EU, the first leg of the rally arguably started on 1st November, from USD 201. The rally then became supercharged on 16th November, from USD 434, and peaked on 29th November, at USD 1163. In November, China was the locomotive of the rally, pulling the prices higher in the US/EU as well. Then in late December, regulatory panic ensued in China, which explains why the sell off there pulled prices lower than elsewhere. 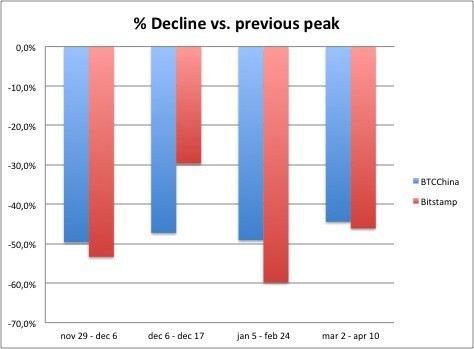 The recovery was orderly, resulting in a small spread early January. The collapse of Mt. 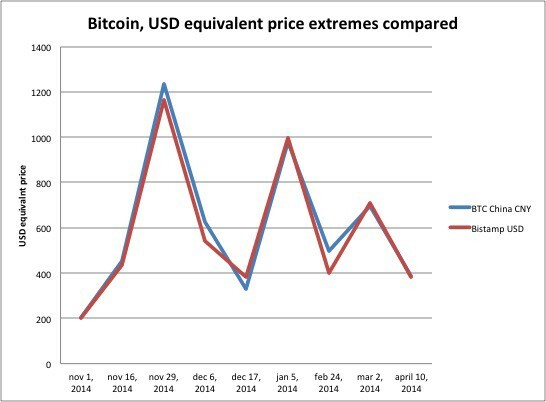 Gox affected US/EU psychology to a much greater extent than that of China, which is why on February 24 prices went +20% deeper in the West. Interestingly, despite the latest bearish news from China, the spread is now positive, meaning that the Chinese are willing to pay more for a Bitcoin than we are. This could be a sign that we are underestimating the resourcefulness of Chinese buyers in converting yuan into bitcoin going forward. Let’s take a look at some other fundamentals to try and see whether there is support for a +/-$400 price in the markets. 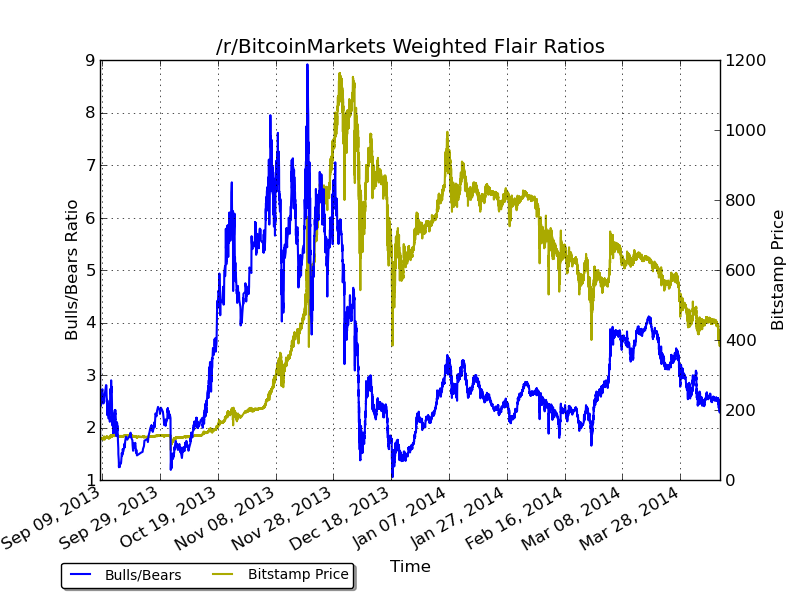 Here is the weighted bull/bear ratio from the r/bitcoinmarkets subreddit (now 14,000 traders). The blue line represents the daily interest rate for borrowing dollars on the platform. We can clearly see how the market got overheated by late December. Right now we can see how it is quite cheap to borrow dollars there (0.095%), but the interest rate is still higher than during the Mt. 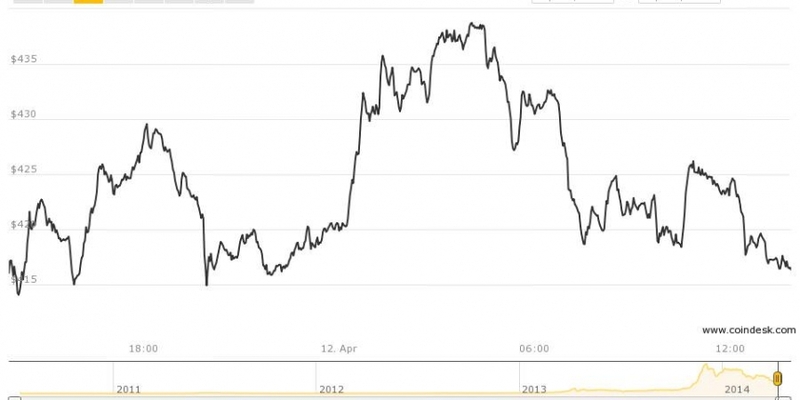 Gox collapse (0,068%) and also higher than the low of the 1st January crash (0.087%). A retest of the $260 April high would form a strong bottom for a new rally to be built on – a drop below $350 will likely lead us there – but based on the data above (and the strong signs that Wall Street is getting ready to move in), I suspect that if it happens, such a drop would be short lived. I’m still not convinced prices will dwindle significantly lower than the $380 levels. With likely troubles ahead for the Western stock markets, and with that also the legacy banks and governments, I expect wind in the sails for hard money by summer or fall. Finally, I encourage readers to take this analysis for what it is: a very rough estimate based on available historical data. I see these analyses as exercises to prepare myself psychologically for what could be ahead. Personally, I don’t trade with more than 2-3% of my bitcoin holdings. Knock on wood: so far this strategy has helped me dodge quite a number of bullets in this exciting Wild West of Money. This article originally appeared on Medium, and has been republished here with permission.